The George Inn has a rather large number of regulars gracing its halls on a daily basis. It’s also the last remaining galleried coaching inn that’s still open to the public, which means that its wide halls and staircases are roomy enough to handle its regular clientele. 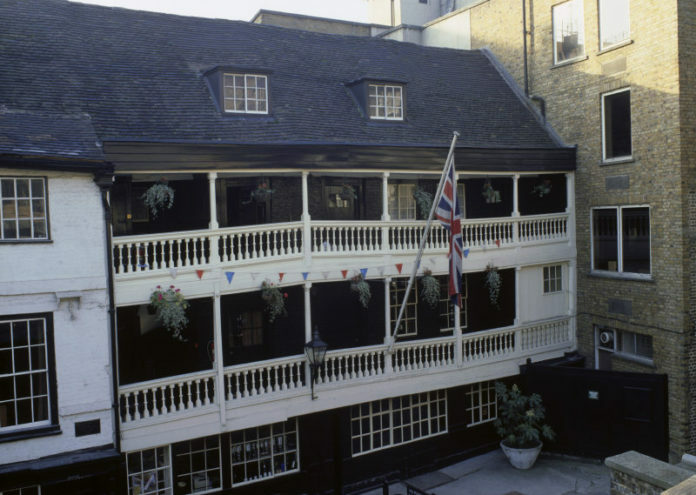 Officially rebuilt in 1677, The George Inn welcomed the likes of William Shakespeare and Charles Dickens, back when it also functioned as a coffee house. The George Inn even gets a mention in Dickens’ Little Dorrit. Many London pubs bear the name “Duke of York”. However, this is the only one that officially got permission from Prince Andrew, the literal Duke of York, to use his image on their new pub sign. Located at the northern corner of historic Rathbone Street in Fitzrovia, the Duke of York was famously visited in 1943 by writer Anthony Burgess and his wife Lynne. Legend has it that the two were having a quiet drink when a local gang suddenly invaded and trashed the pub. Lynne was visibly distraught at the sight of wasted beer, leading the gang to challenge her to empty some pints. She happily rose to the challenge, impressing the gang enough to pay for the beer and offer her protection from London’s other gangs. It’s quite possibly one of the real-life events that spurred Burgess to write his violent ode to anti-violence, A Clockwork Orange. 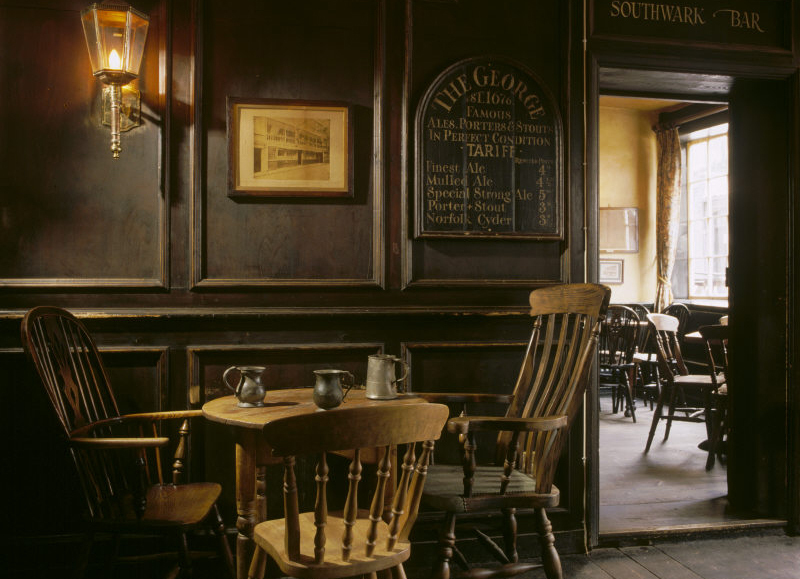 With a somewhat grisly history – this pub was once the final watering hole en route to the hangman’s noose at Marble Arch – the Bloomsbury Tavern in Holborn is a lot more convivial these days. 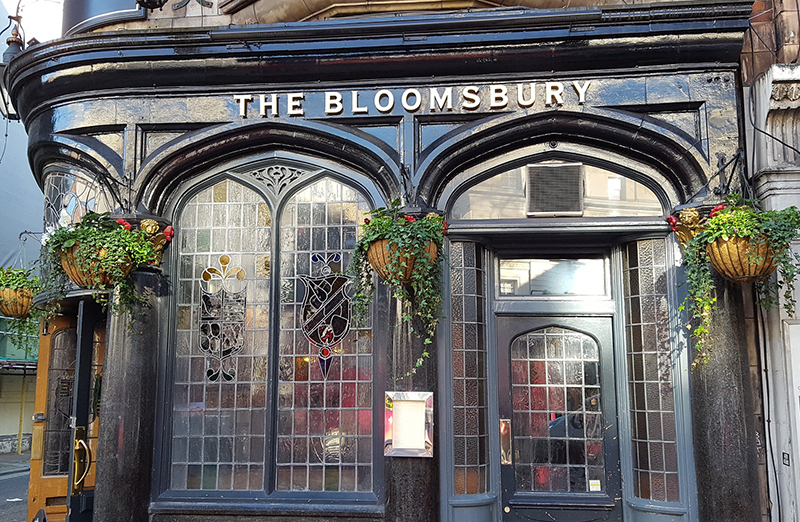 With a proud history dating back to 1856, and a lovely interior to match, with stained-glass windows and wood panelling galore, this is a lovely place for a pint. This otherwise unassuming pub on Northumberland Avenue reveals its true nature once you visit its upstairs room. The moment you step into the dining room, you’ll be instantly transported to 221b Baker Street – the shared home of none other than Dr. Watson and Sherlock Holmes. Formerly known as the Northumberland Arms, the owners lucked out in 1957 when they gained possession of a complete Sherlockian exhibit that had been put together for the 1951 Festival of Britain. If you’re wondering if the exhibit is worth a visit, it’s officially curated by the Westminster Library for authenticity. So yes, the crowds of tourists are onto something. Formerly known as Bucket of Blood, this Rose Street pub used to be an important site for good old British bare-knuckle boxing in the 19th century. Today, the only beating you can look forward to at the pub is when they serve an absolutely mean, gravy-laden roast on Sundays. Look for the historic photographs of rumoured regular, Charles Dickens, on the pub’s walls. This fictional bar, which served as the setting for the popular show Only Fools and Horses, was actually shot in a number of real-life pubs all over the UK. Although the story itself was set in Peckham, none of the actual filming took place there. The Nag’s Head was actually shot using several pubs in London, Brighton, Ipswich, Salisbury, Bristol, and Hull. This includes the spacious Bristol Flyer on Gloucester Road, Bristol, which specialises in local ciders as well as real ales, and the now-closed White Horse Pub at Bedminster, which is also in Bristol.